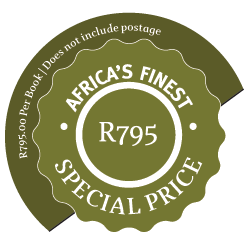 Purchase a copy of this inspiring and educational coffee-table & reference book on the best of Africa’s safari world with spectacular full colour photos accompanied by in-depth reviews of Africa’s most sustainable and responsible safari destinations. To order your copy / copies of Africa’s Finest, please follow these steps. We will reply confirming your order price inclusive of postage. Upon receiving your invoice you can click on the PAY NOW button below or follow the link in the email where you will be directed to our secure online credit card payment gateway. Once we have confirmation of the payment, your book/s will be dispatched followed by an email confirming this with a tracking number for your package. We will reply confirming your order price and postage. NOTE: Bulk orders of 5 or more will receive further discounts depending on quantity. A limited number of hand bound, leather covered, individually signed Collectors Editions are available at US$400.